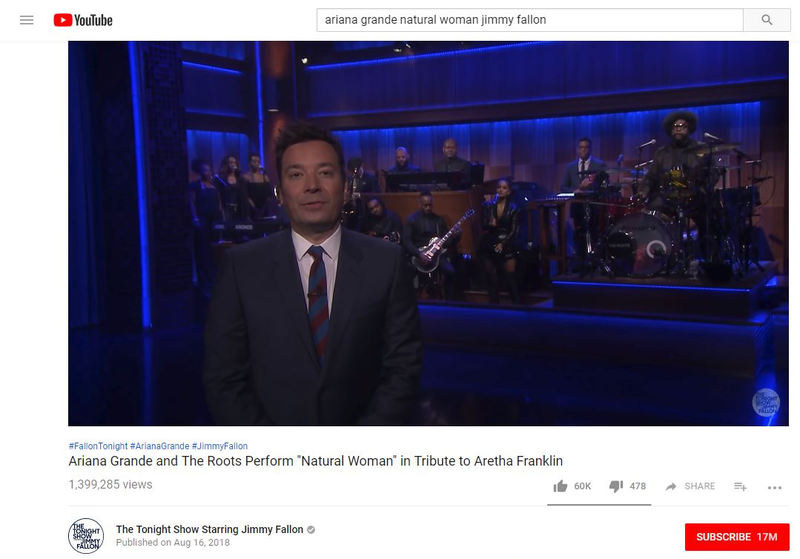 Ariana Grande covered Aretha Franklin’s “(You Make Me Feel Like) A Natural Woman” with The Roots on “The Tonight Show” starring Jimmy Fallon. In 24 hours, this performance received over 1.3M views on YouTube. Jimmy Fallon introduced Ariana Grande’s performance with The Roots. Then, Grande’s vocals shined while The Roots helped her pay a heartfelt tribute to the Queen of Soul. Aretha Franklin transitioned on August 16, 2018 due to pancreatic cancer. Franklin recorded a list of classic hits including “(You Make Me Feel Like) A Natural Woman”, “Respect”, and “Chain of Fools”. Aretha Franklin’s musical career lasted for over fifty years. Franklin’s powerful legacy as the Queen of Soul, humanitarian, and icon will live on forever.